Thinking of heading towards Bangkok Thailand? It’s about as energetic and exciting as any city can get, only this one has so much more to offer. And with reasonably priced fares to get you there, it's a good reason to get going. And with big companies offering great deals, getting there has never been cheaper or easier. To get you in the right mood, here is some information about the city you should know before going. If you desperately need a break from the snow and icy weather on your annual holiday, then perhaps the city of angels might just be the right place for you to visit this time round. And did you know that Bangkok was once named the world’s hottest city by the World Meteorological Organization? Best to stay hydrated. World famous for the friendly nature of its citizens, one of Bangkok’s nicknames is the Land of Smiles. And it’s no myth either. You'll immediately notice the gentle temperament, the cool charm and general warmth of your hosts as soon as you arrive in this lively city. However, it's worth being a little cautious too. You may think you know Bangkok and all it stands for but what you may not know is that the city isn't actually called any of that. If you really want to impress the locals here, you need to eschew the catchy nickname in favour of the city’s full ceremonial title. Krung Thep Mahanakhon Amon Rattanakosin Mahinthara Yuthaya Mahadilok Phop Noppharat Ratchathani Burirom Udomratchaniwet Mahasathan Amon Piman Awatan Sathit Sakkathattiya Witsanukam Prasit. Wow! That seems like a huge mouthful to swallow. Nevertheless, give it your best shot. You may need to go over that a few times before you’re ready to try it out. Bangkok and the surrounding area is known for its great many Buddhist Temples making touring around a few of them a key component of any Thai holiday. Chief among them is Wat Pho, the Reclining Buddha Temple. It has to be seen to be believed. A tour of the Grand Palace and Wat Phra Kaew is also a must. In the year 2008, The World’s Best Awards Reader’s Survey, conducted by travel magazine Travel and Leisure, awarded Bangkok, Thailand the World’s Best City, beating off competition from other top tourist destinations such as Florence and Bali. Bangkok today still remains in one of the top five positions. Quote 2: "The world is a book and those who do not travel read only one page". (Saint Augustine) Having said this, it will definitely be worth your while to see more places of interest in Bangkok by reading at least one more page on this site. Bangkok has a reputation as one of the finest places to discover food and no Bangkok trip is complete without experiencing a food tour. Join one of our tours and walk your way through its most yummy districts. For more details, please click the link above. 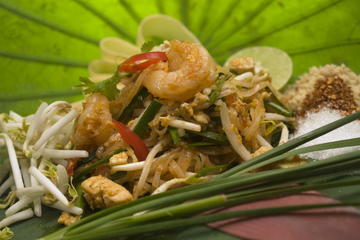 Food is central to the whole Thai experience. If you really think you know what Thai food is all about, you may need to think again. There’s nothing quite like it on this planet to beat the sheer anticipation and exhilaration of a Bangkok food market. And as always, it's simply incredible value for your money. Fried cockroaches and caterpillars are served right next door to more conservative (to western palates) dishes like the classic Pad Thai. 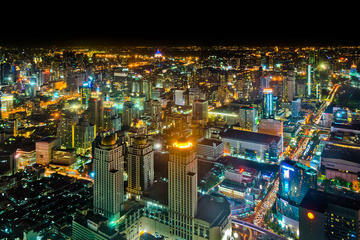 At the other end of the scale, the city of Bangkok also boasts many top five-star restaurants of international renown. Download a vibrant MP3 Self-Guided Audio Tour combined with a fully detailed map of Bangkok. This fascinating audio tour of the energetic city of Bangkok will guide you through the narrow streets where you'll see amazing Buddhist Temples and learn about the colourful history of Thailand. Enjoy this self-guided audio tour at your own pace combined with a map detailing the area of your tour. All will be revealed by clicking the link above.